Thank you for your interest in volunteering for the Festival of Trees! Are you a champion of children’s literacy? Would you like the chance to work with notable children and young adult authors plus the readers that are their fans? Have you ever been to a “rock concert” for reading? Have you heard thousands of kids screaming for books? This is your chance – volunteer at the Festival of Trees! The Festival of Trees is an exciting event that attracts thousands of young readers. 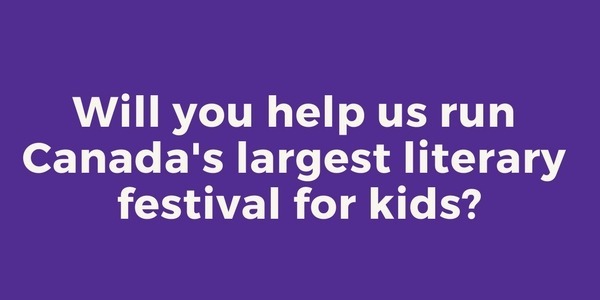 It is the culmination of the Forest of Reading, the largest recreational reading program of its kind, and celebrates Canadian authors and illustrators from across the country. French is an asset but not necessary, as many of the children attending will be English-speaking from French immersion schools. Volunteer for 3 days: Receive $20 towards an OLA Membership, a free Education Institute Webinar, and a chance to win a FREE Super Conference registration (value $400+). Duties may include: accompanying authors and illustrators around the site, helping out at the registration desk, supporting programs, activities and workshops, and other duties as assigned. Listed on the website you will find a detailed schedule of what is happening in each city. Please familiarize yourself before you arrive and you will be given your posting when you arrive. For those who have committed to volunteering at the Festival, we have created a dedicated Festival Volunteer Information webpage. This is where you will find all important information regarding volunteering at the Festival. Be sure to read this webpage thoroughly!